A spectacular seascape of some 1,600 limestone islands and islets towering from emerald water, Ha Long Bay is also an outstanding example of earth's history. 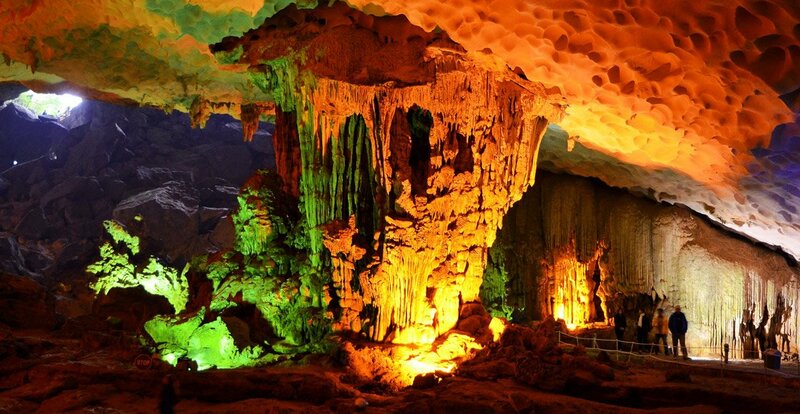 Those limestone pillars are covered by lush green of tropical plants and boast amazing karst grottoes, caves and caverns. The Bay was first recorded as a UNESCO World Heritage Site in 1994 thanks to its exceptional natural beauty and aesthetic importance. In 2000, it had the honour of being recognised the second time for its significant geomorphic features, as a billon-year-living proof of Earth's formation. Many travelers are unaware that Ha Long Bay actually has an immense value to the world because of its rare concentration of biodiversity, culture and history. Hence, this unique is exactly what makes Ha Long Bay a magical destination where travellers can have the chance to get up close and personal with the beating heart of Vietnam. According to the Sino-Vietnamese, “Ha” means descending and “Long” means dragon. Therefore, Ha Long Bay literally means "the bay of the descending dragon", a fusion of ancient mythology and Vietnamese history. Same as Vietnam and Viet Nam, Halong is more popular through word of mouth due to a perception that has been existed for a long term while Ha Long is still an official name of the Bay. Ha Long Bay is located in Quang Ninh Province, northeast Vietnam, just 180 km east of Hanoi; surrounded by Bai Tu Long Bay, Lan Ha Bay, Cat Ba Island, Tuan Chau Island and Ha Long City. While Ha Long Bay is not a large area, it packs some 1,600 limestone islands and islets into its 1,553 km2. Limestone towers, green islands and islets boast karst caves, caverns and grottoes, many hidden and still waiting to be discovered. Some islands are completely hollow. Framing the islands are gorgeous beaches, the emerald sea lapping gently on the soft, white sand. Cruising the green islands is the only way to truly experience Ha Long Bay. On a wooden junk or cruise vessel, you can take in the picture-perfect serenity of the area from balcony, sun deck and the front of the boat in complete luxury. Watch the sun rise and set over the Bay, all pink and orange and plump, and breathe the fresh air - tangy with salt - deep into your lungs, recharging your soul. Ha Long Bay is located in Quang Ninh Province, northeast Vietnam, just 180 km east of Ha Noi; surrounded by Bai Tu Long Bay, Lan Ha Bay, Cat Ba Island, Tuan Chau Island and Ha Long City. While UNESCO recognition is relatively recent, Ha Long Bay has been billions of years in the making. For eons, the deep water of the Bay was filled with fine mud and sediment that rarely shifted, even with rising and falling sea levels. It was in the Carboniferous period - during the late Paleozoic Era and some 300 million years ago - that the area lifted due to tectonic activity. The shallower and warmer water in the Bay formed the limestone - up to one kilometre thick - that makes Ha Long Bay so unique. During the Jurassic and Cretaceous periods, the area shifted again and, over millions of years, became mountainous highlands, exposing the limestone and forming karsts. The limestone karsts eroded over time, forming millions of small caverns and canyons. Flooding caused the bay to sink, turning caves and tunnels into deep valleys amid rising columns of rock as the limestone dissolved. 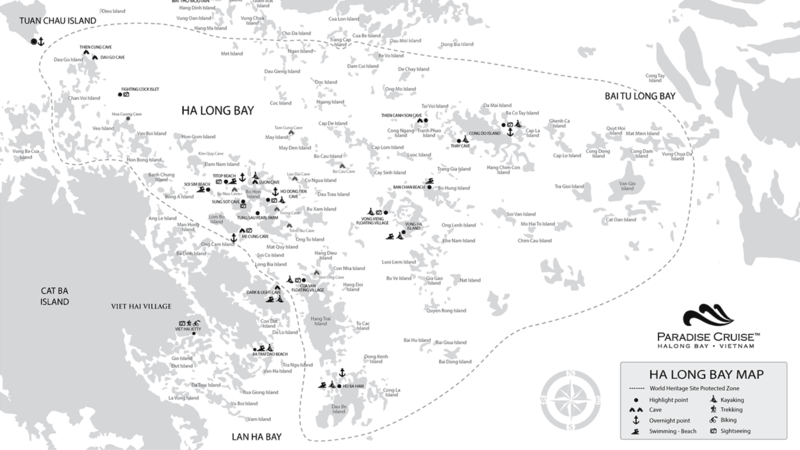 It is interesting to note that the Ha Long Bay we see today is only around 7,000 years old. Aside from the geology and landscape, what is also of interest to tourists who visit Ha Long Bay is the rich tradition of ancient Viet culture found in the area, with the Soi Nhu culture being the oldest culture, followed by Cai Beo, then Ha Long. The Soi Nhu culture was first detected by Swedish archaeologist, geologist and paleontologist Johan Gunner Andersson in 1938. 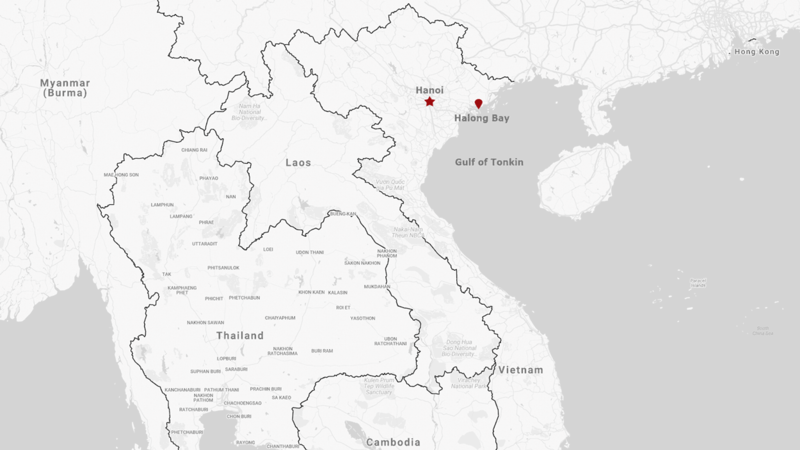 On various digs in the area, he found evidence of ancient Vietnamese people in Ha Long Bay and Bai Tu Long area. In 1967, Vietnamese archaeologists uncovered stone tools and ceramic fragments as well as human and animal fossils in Soi Nhu cave. Piecing together the archaeological evidence, it became clear that the Soi Nhu people subsisted on shellfish, supplemented by local fruits and vegetables. Subsequent geological studies revealed that Soi Nhu culture existed between 6,000 to 18,000 years ago, and were scattered across the Gulf of Tonkin in Ha Long Bay, Bai Tu Long Bay and Lan Ha Bay. Around the same time as Johann Andersson uncovered the existence of the Soi Nhu people in 1938, French archaeologist Madeline Colani discovered the Cai Beo culture. These peoples lived in the Lan Ha Bay and Ha Long Bay area some 4,000 to 7,000 years ago, and were a continuation of the Soi Nhu culture. Excavations in the area have yielded a rich supply of over 500 artifacts used by the Cai Beo: pestles and mortars, grinding tables, axes, nets, statues and unfired pottery, as well as human and animal bones. Bronze implements and decorated pottery have also been uncovered that indicate the Cai Beo culture was quite advanced. In the late Neolithic Age to the Early Metal Age - around 3,000 to 4,500 years ago - the Gulf of Tonkin was home to the Ha Long culture. Also known as the sea culture, the Ha Long people occupied Ha Long Bay, Bai Tu Long Bay and Lan Ha Bay. 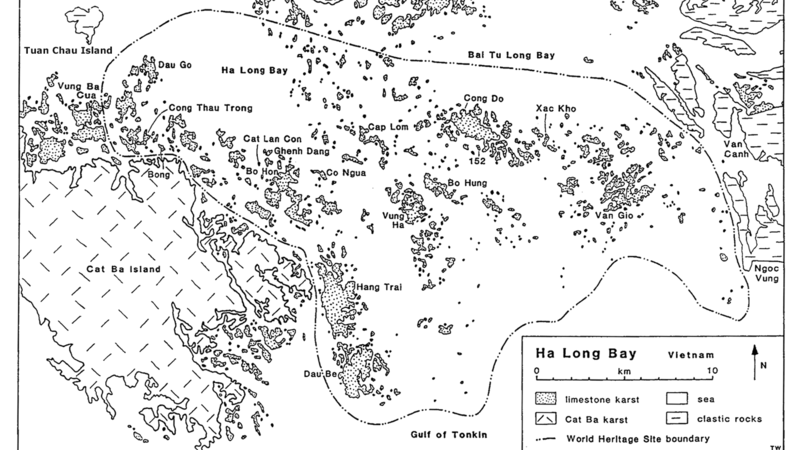 The Ha Long people were essentially fisherman, and many artifacts associated with their way of life - including nets, implements and boats - have been discovered on the islands and in the caves of the Bay. Not so well known is the biological diversity of Ha Long Bay: the area supports complex ecosystems and is home to dozens of rare plants, animals and aquamarine species. The geography of Ha Long Bay, with its unique landscape of ocean, mountains and forests has formed a number of ecosystems: tropical rainforest, marine and coastal. Coastal mangroves, coral reefs and seagrass habitats are typical features of these kinds of ecosystems. Along the coast, large estuaries - the habitat of numerous species of marine creatures - provide an abundant and rich food supply, as well as shelter for breeding. Marine biologists have recorded the existence of 185 species of phytoplankton, 500 species of fish, 232 species of coral and 57 species of crab in the waters of the Bay, many of which are recorded in the IUCN Red List as rare. And the thousands of islands and islets that comprise Ha Long Bay provide additional coastline and sheltered bays that support diverse marine life. Concentrated around the eastern and southern shores at a depth of around 4 to 6 metres are bright and colourful coral reefs. The vibrant coral takes the shape of disks, trees and forests, and supports more than 100 species of fish, seaweed, crustaceans and microscopic marine creatures. On land, particularly near Tuan Chau, Cua Luc, and Ba Che, mangroves are plentiful. Mangroves, which grow in coastal saline or brackish water in the intertidal zone, create and sustain a fascinating and complex ecosystem of fish, crustaceans and shellfish, and are also the territory of a variety of birds and other animal life. The climate and geography of Ha Long Bay also supports an abundance of forests and tropical rainforests, with many species of trees, plants and animals present. It is estimated that there are more than 1,000 species of plants in forests and on islands, and over 1,150 species of animals. Explore any one of these forests and rainforests, and eagle-eyed tourists will be able to spot deer, mink, squirrels and monkeys, as well as bird life. How Ha Long Bay came to be is deeply ingrained in Vietnam mythology. Legend has it that the Gods wanted to protect Vietnam against warfare so they sent dragons to shield the country from invaders. These dragons showered precious gems onto the area - including jade and emeralds - which were transformed into the islands and islets of Ha Long Bay. These islands and islets offered natural protection against trespassers and attackers, and provided the perfect setting for protective ambushes by the Vietnamese warriors. And often, like magic and on cue, mountains of rock would rise defensively from the ocean, and sink the ships of invaders. Once Vietnam was secure as a nation, the dragons toured the world in peace. When the tour was over, the mother dragon descended to Ha Long Bay - Ha Long literally means descending dragons - and settled there, while her dragon children found sanctuary on Bai Tu Long Bay and Bach Long Vi Islands. References to “Ha Long” did not appear in Vietnamese literature until the early 19th century, though. Rather, the area was referred to as the seas of Giao Chau, Luc Chau, Luc Thuy, Van Don, Hai Dong or An Bang. 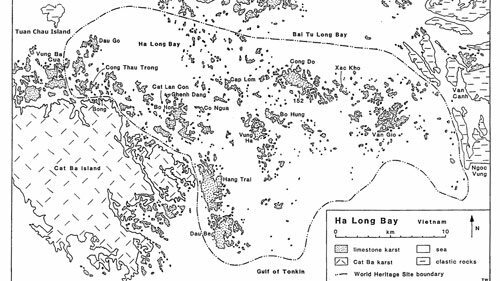 And it was only towards the later part of the 19th century that Ha Long Bay appeared on French navigation maps of the Tonkin Gulf. On-board: cruising, enjoying food and drink, spa and wellness treatments, cooking demonstration, Vietnamese tea ceremony, Vietnamese wine tasting, BBQ, Tai Chi sessions, reading, sunbathing, sightseeing, watching the sunrise and set, squid fishing, taking photos, movie nights. Off-board: visiting islands, visiting caves, kayaking, getting up close with the locals, fishing village excursion, swimming, dining on beach, photos, enjoying food and drink, spa and wellness treatments, BBQ, sunbathing. No doubt this is the most beautiful place I’ve ever visited! The crystal clear blue water along with unique scenery was breathtaking. Though the place is packed with tourists, it doesnt dampen the beauty at all. Highly recommended! Before coming here I thought It must be extremely crowded and polluted like any other popular tourist attraction. Well to be fair it was crowded and I wouldn’t say it’s as clean as a hound’s tooth, but the view still exceeded my expectation! Cruising among numerous limestone towers, green islands and islets was unforgettable! We decided to book a 2-day-1-night cruise to truly experience Ha Long Bay and didn’t regret at all. The scenery was merely magical and extremely picturesque. The cruise made my trip even more exciting with a wide range of activities including kayaking, exploring astonishing caves, cooking class,.. Ha Long Bay is definitely a MUST! There are two key events, including Tết (Vietnamese New Year in Jan/Feb, dates vary) and Christmas. On these holidays, Vietnamese stay at home so Ha Long Bay is not crowded as usual, cruises and streets will be well-decorated in festive theme. 30th April and 1st May are public holidays, Ha Long Bay will be packed with Vietnamese tourists. Independence Day September 2nd is a national public holiday, Ha Long Bay turns red by Vietnam flags. Ha Long Carnaval is an annual street festival taking place at the end of April or/and start of May, an occasion for Ha Long Bay to show off its cultural charm. The first peak season runs from June to July, which attracts mostly Vietnamese and Asian travellers. The period between December and February is the second peak season with tourists coming from Europe, America and other countries in frigid and temperate zone. The first off-peak season runs from April to May and the second lasts from August to October. Prices in the second peak season are generally 10 to 20% higher than the off-peak season and availability may be an issue, so book your cruise early to secure a slot in accordance to your preference with the best price. Ha Long Bay has tropical monsoon and coastal climate, weather varies in 4 different seasons. Spring lasts only two months March & April yet it is the most beautiful season with cool to warm weather. Summer lasts from May to August with glorious shades of blue sky and emerald water which is perfect for cruising islands. During Fall - September & October, colours are soft like honey, shadows long and the atmosphere serene. The 4 remaining months is Winter and is suitable for low pace travelers who enjoy cooler atmosphere and the magical and mystical beauty of Ha Long Bay. May to June and August to September are rainy periods of the year. 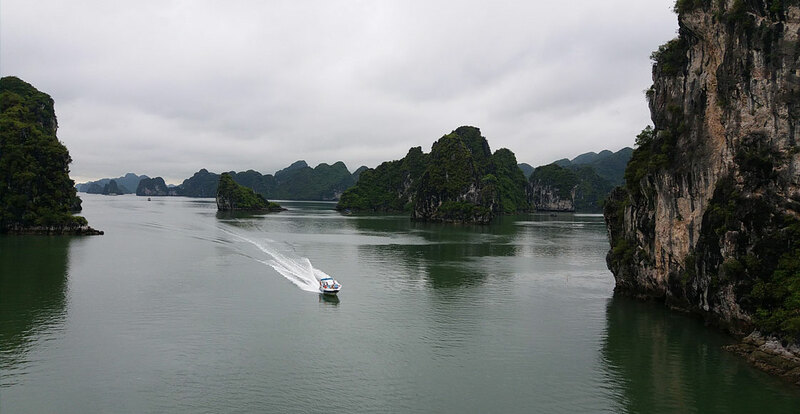 >> Read more about The best time to cruise Ha Long Bay and weather in Ha Long Bay to help you decide the right time to visit. Cruises appeared in Ha Long Bay almost 30 years ago, beginning with day trips on traditional wooden junks that had been upgraded from fishing boats. From the early 2000s, overnight cruises were organised to meet the needs of travellers who wanted a richer and deeper experience, international travellers can board at any docks (Bai Chay, Hon Gai,...). From 01 Jan 2016, only Tuan Chau and Hon Gai are the two official international cruise ship ports. Overnight cruising is the best way to experience Ha Long Bay. The most popular is a 2-day, 1-night cruise, which is just an adequate amount of time for travellers to discover the beauty of the Bay with a range of fascinating excursions. With a 3-day, 2- night cruise, visitors can travel deeper into the bay and visit more “off the beaten track” locations. >> Have a look at these best overnight cruise packages for 2018 season. For the time poor traveller, a day cruise will give visitors a delightful experience of Ha Long Bay, and generally includes one or two excursions or activities. Options include a half day and full day cruise, and the Paradise Explorer is perfect choice for a day cruise of Ha Long Bay. Most cruise lines in Ha Long Bay provide charter or private cruising options. Paradise Elegance I and II, as the newest and largest boats in our fleet, are the best choices for MICE or large groups. Paradise Peak and Paradise Luxury would suit smaller parties. >> Visit the Ha Long Bay cruise guide page to help save you time while planning your Ha Long Bay trip. >> Check out this handy guide to selecting the best Ha Long Bay cruise. As one of the most visited destinations in Vietnam, Ha Long Bay and other surrounds has their own charm that is guaranteed to wow travellers. Tours of the area are designed to support visitors to make the most of their trip to Ha Long Bay and northern Vietnam. Explore the ancient city of Hanoi before or after cruising Ha Long Bay. Stay in one of the finest and oldest hotels in Hanoi - Sofitel Legend Metropole or Meliá - before transferring to Ha Long Bay in a luxury private vehicle or a seaplane for spectacular views of the Bay. Discover the fascinating culture of ethnic minorities, visit the highest mountain in Indochina and see the traditional rice paddies and terraces, and beautiful mountain scenery of Sapa. Located about 316 km north of Hanoi, a trip to Sapa as well as a Ha Long Bay cruise will round out your adventure of northern Vietnam. Ninh Binh - a small province in the Red River Delta region, 94 km south of Hanoi - is known as Ha Long Bay on land by its beautiful karst limestone landscape, besides from ancient temples and other historic sites. Ninh Binh is well worth a visit and should be included in any northern Vietnam itinerary. >> Check out the best Ha Long Bay tours and overnight cruises for your 2018 vacation. Night cruises on Ha Long Bay are usually made of wood or steel which are relatively small with 1 to 30 cabins each. The cheap cruise boats are usually old, less comfortable and have smaller cabins. On the other hands, luxury boats offer cabins which are generally larger with area of from 10m2 to 20m2, including a bedroom & bathroom, hot & cold shower, air conditioning; some cabins may have private balcony and bathtub. Exclusively onboard Paradise Peak, there are a library and a fitness room, some cabins own a dining area. There are more than 1,300 hotels with more than 20,000 rooms available in Quang Ninh Province, and around 90% of the 3, 4 and 5 star hotels are located on the shore of the Bay. As one of the most popular tourist destinations in Vietnam, the quality of hotels around Ha Long Bay is generally good, as are prices. One night in 5 star hotel is around USD 100-150 per night, while a stay in a 4 star hotel is around USD 50 - 80 USD per night. If you are planning to stay on Tuan Chau Island, Paradise Suites Hotel is perfect for those who adore tranquillity and seclusion. Food is an essential part of any trip, and travellers who visit Ha Long Bay will be delighted with the range of gastronomic offerings. Contemplate Ha Long Bay’s marvellous scenery while enjoying delicious Vietnamese cuisine onboard your Paradise Cruises. Every dish on Paradise Cruises is made with the freshest quality ingredients sourced right here in Ha Long Bay. 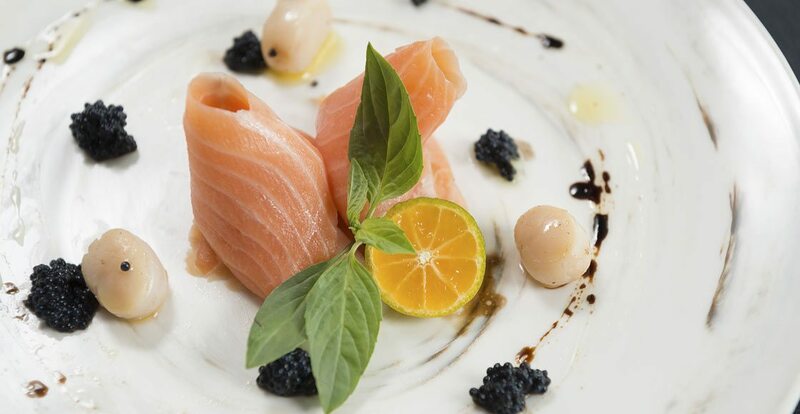 Our chefs have designed menus to delight the most discerning diner, and feature local Vietnamese delicacies and classic western dishes. 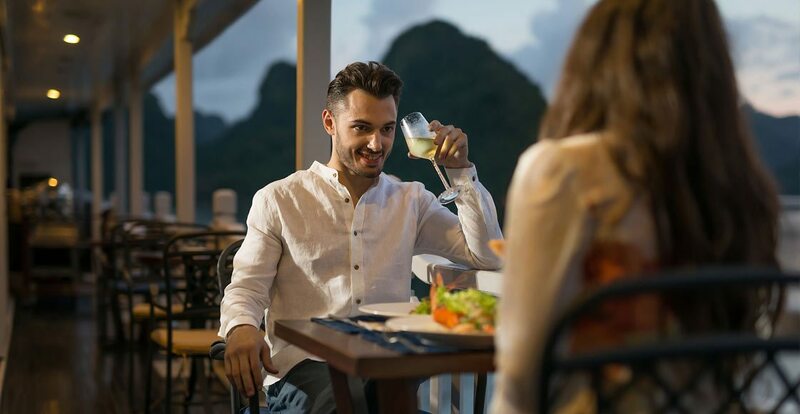 There are hundreds of restaurants in Ha Long Bay, from street food vendors and local restaurants serving freshly caught seafood to high-end restaurants with an array of Vietnamese, Asian, Western cuisines and fine dining options. Hanoi Restaurant in Paradise Suites Hotel and 1958 Restaurant in Tuan Chau Island serve authentic Vietnamese cuisine featuring fresh seafood dishes from the north. 1958 is the best restaurant in Ha Long Bay, rated as the first choice by travellers on TripAdvisor for many years. Getting to Ha Long Bay is easy, and round trip transfers are usually arranged as part of your cruise package. The nearest airports are Noi Bai International Airport (in Hanoi) or Cat Bi Airport (in Hai Phong). Ha Long Bay is located just about 180 km east of Hanoi, and generally a shuttle bus or private rental car is used to transfer guests. The drive is usually between three and a half to four hours, with a comfort stop of around 20 - 30 minutes at the half-way point. The Paradise Cruises shuttle bus is only USD 40 per person return. Guests are conveniently picked up and dropped off from their hotels in the Hanoi’s Old Quarter, or at 49 Ha Ba Trung Street if they are staying outside this area. Noi Bai International Airport - which is located 30 km north of Hanoi - is 169 km from Ha Long Bay and the drive takes a similar amount of time as the trip from Hanoi to Ha Long Bay, roughly 3.5 hours. If you wish to hire a private vehicle and driver, the cost of the trip is in the vicinity of USD 160 to USD 180 per car, depending on the type of vehicle. At just over 88 km from Ha Long Bay, the drive from Hai Phong - and Cat Bi Airport - is typically around 2.5 hours. Private cars or mini-vans are usually booked; however, guests can take taxis if they prefer, but this is not common. The cost to rent a private car with a driver is USD 50 to USD 80, depending on the size and type of vehicle. Located about 216 km south-west of Ha Long Bay, the drive to Ninh Binh usually takes 4.5 hours. A private car is the best option for guests wishing to travel to or from Ninh Binh and Ha Long Bay. The cost to rent a private car is USD 50 to USD 80 depending on how many seats are required. Ho Chi Minh City is located over 1,700 km south of Ha Long Bay, and flying is the quickest, easiest and cheapest option. The flying time is around two hours, there are many flights available. Guests can either fly to Noi Bai International Airport or to Cat Bi Airport and then book shuttle or a private car to Ha Long Bay. Have a look at the pictures of the Bay from sunrise to sunset, sweet moments in local culture, cruising experience from summer to winter.